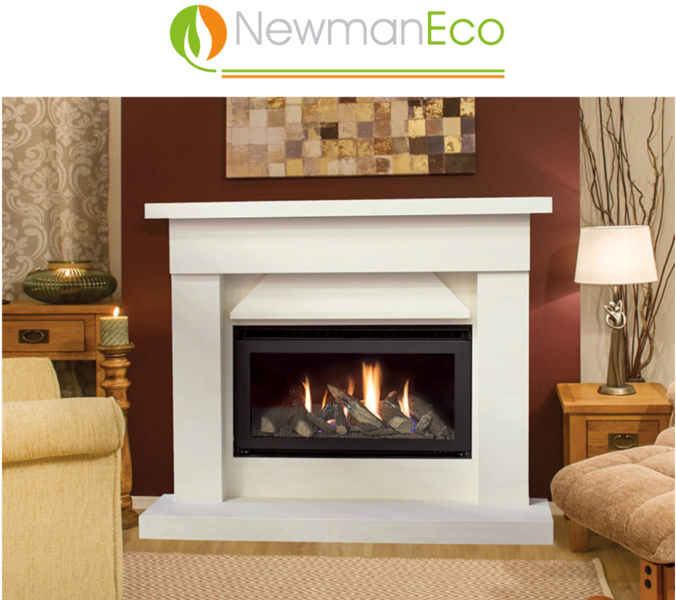 The Newman Eco Clarity High Efficiency gas fire is a medium sized landscape style design making it ideal for hole in the wall style fireplace designs. Class 1 efficiency rated being an amazing 82% efficient therefore offering up to 4.5kw heat output at lower running costs. Superb realistic logs and fuel bed using our clean flame burner create a fire of quality and class. All of the Newmans high efflciency gas fires have hand held remote control with a choice of cream or black fire chambers, a reflective smoked glass chamber is available as an optional extra to enhance even further the fuel bed with leaping flames, simply magical. Optional non reflective facia glass available making the glass frontage nearly invisible. Shown with our Solent natural stone fireplace model this lovely design incorporates a solid stone crafted canopy to give a unique style when used in conjunction with the Newman Eco Clarity High Efficiency gas fire.